In modern software systems, deployment is an integral and critical part of application development (see, e.g., the DevOps approach to software development). Nevertheless, deployment is usually overlooked at the modeling level, thus losing the possibility to perform deployment conscious decisions during the early stages of development. 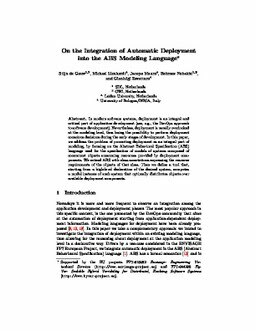 In this paper, we address the problem of promoting deployment as an integral part of modeling, by focusing on the Abstract Behavioral Specification (ABS) language used for the specification of models of systems composed of concurrent objects consuming resources provided by deployment components. We extend ABS with class annotations expressing the resource requirements of the objects of that class. Then we define a tool that, starting from a high-level declaration of the desired system, computes a model instance of such system that optimally distributes objects over available deployment components.